Upon managing your trees and bushes, we initially look with an eye for safety and user convenience, determining what must be trimmed to clear your building(s), walkway(s), passing vehicles, and employees, customers, and/or guests. 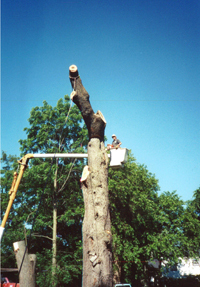 If we determine that a tree is sick or dead, we remove it as well as the stump. Our creative eye brings your property an aesthetic appeal to help represent your property professionally. Thus, we will ensure that your trees and bushes look sharp and well-kept, contributing to an attractive outdoor environment, instead of looking chopped or newly trimmed. Anticipate our comprehensive cleanup activities at the end of a job. Any job we do for you will bring you a professional, clean, and orderly result. Should you have power lines running through your trees, Grant’s Tree Company is experienced in carefully trimming around your utility wires. While many tree companies do not have this expertise, owner Don Grant is actually a journeyman tree trimmer for power lines. Therefore, Don and his highly-experienced and reliable team will gladly trim around your utility wires. Should you have trees that are too close to your building(s) or access areas, we will trim and/or remove trees to avoid current or future issues. Further, we are professionals, and safety is first. Thus, we protect you, your buildings and grounds, and those who enter and leave your property(ies). We look forward to building a long-term association with you.